With the handbrake on! After testing the Inspiron 15 with Nvidia's Max-Q technology, we have now also taken a look at the entry-level model of the series. But the storage device leaves a bit of a bad taste in our mouth. 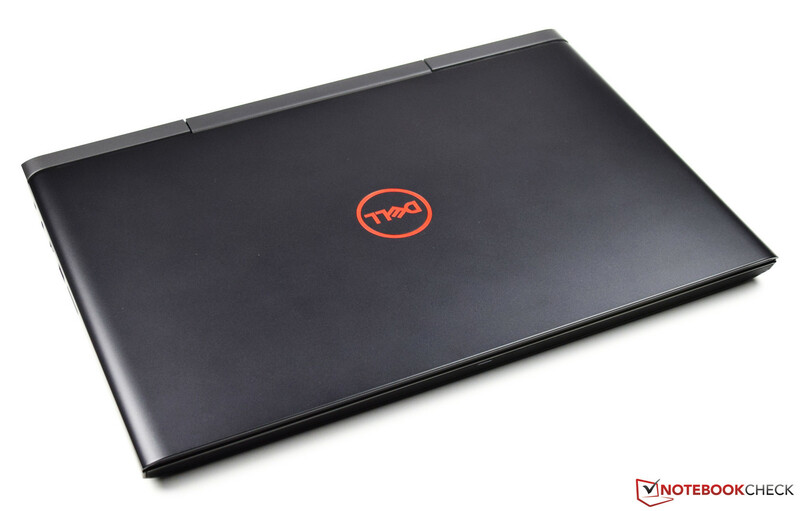 The Dell Inspiron 15 is an affordable entry-level model that lets you enter into in the world of gaming. At a price of $750, our test configuration gives you a solid base that can also display demanding games. 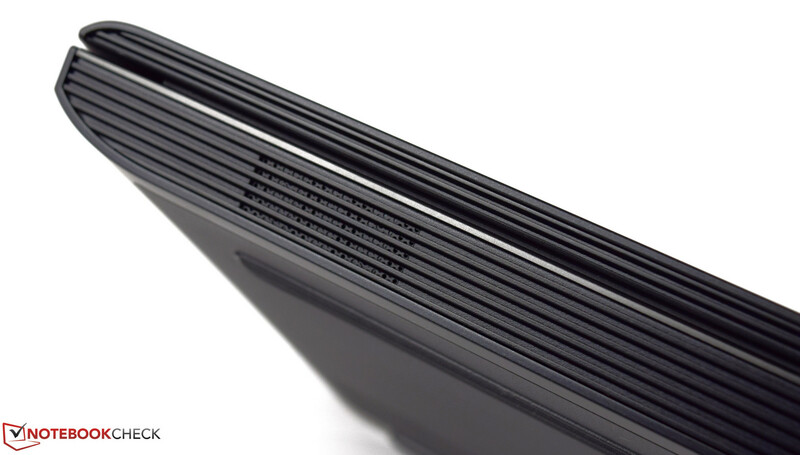 The base configuration is an Intel Core i5-7300HQ with 8 GB of DDR4 RAM and a 1-TB hybrid storage device. 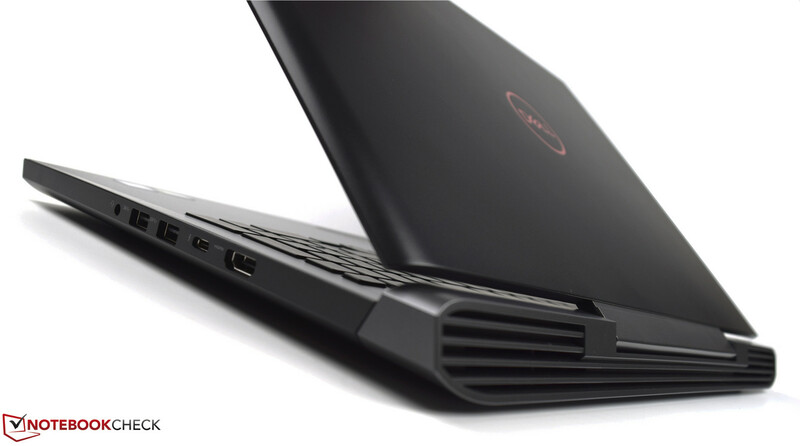 Dell has made use of an Nvidia GeForce GTX 1050 for 3D applications in this entry-level model. 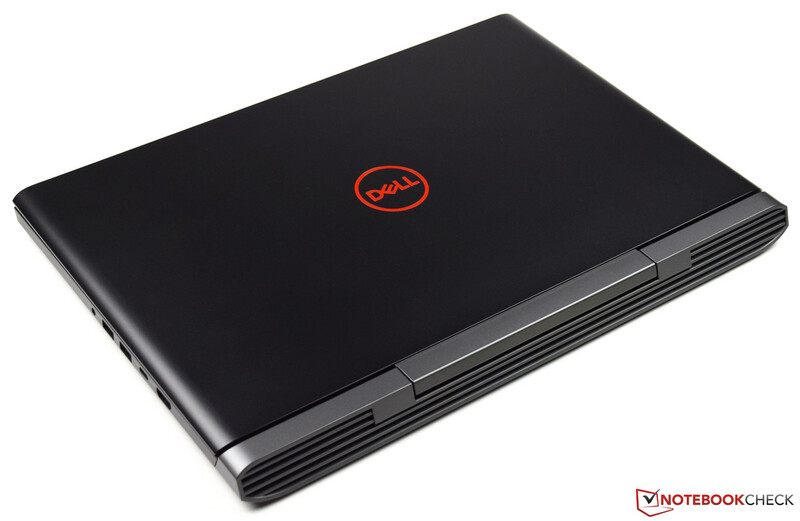 If you require slightly more power, you can purchase the Dell Inspiron 15 7577 with the faster Intel Core i7-7700HQ and an Nvidia GeForce GTX 1060. 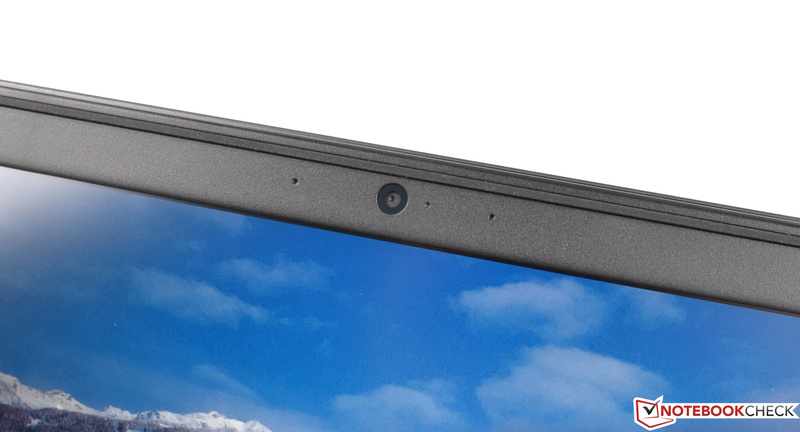 The top configuration of the 15-inch model is even equipped with a 4K panel. However, this increases the price to $1500. 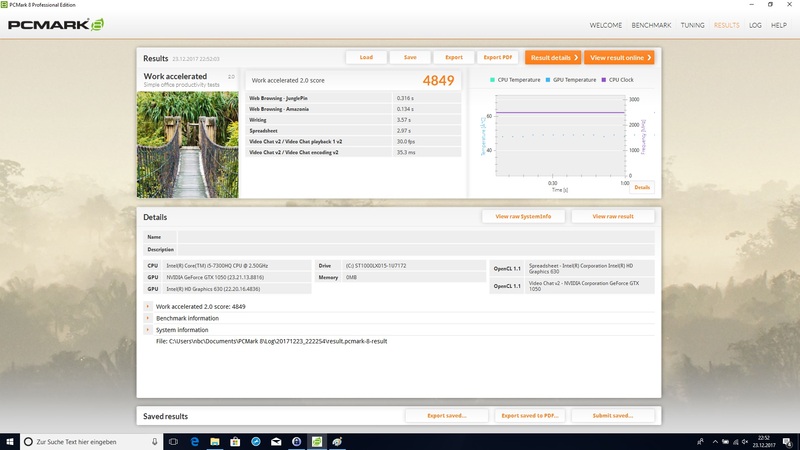 In order to get a good idea of the device's performance, we have chosen some comparison devices that have similar configurations as our test unit. Please see our table below for more information on the comparison devices. 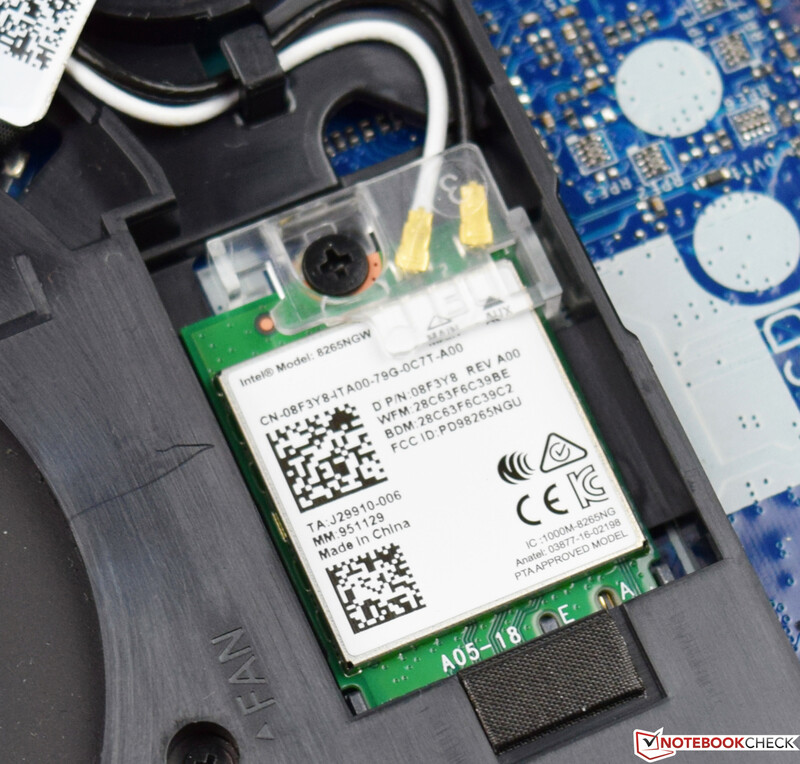 Please take a look at our review of the other recently tested Dell Inspiron 15 7000 7577 for information on case, connectivity and input devices. 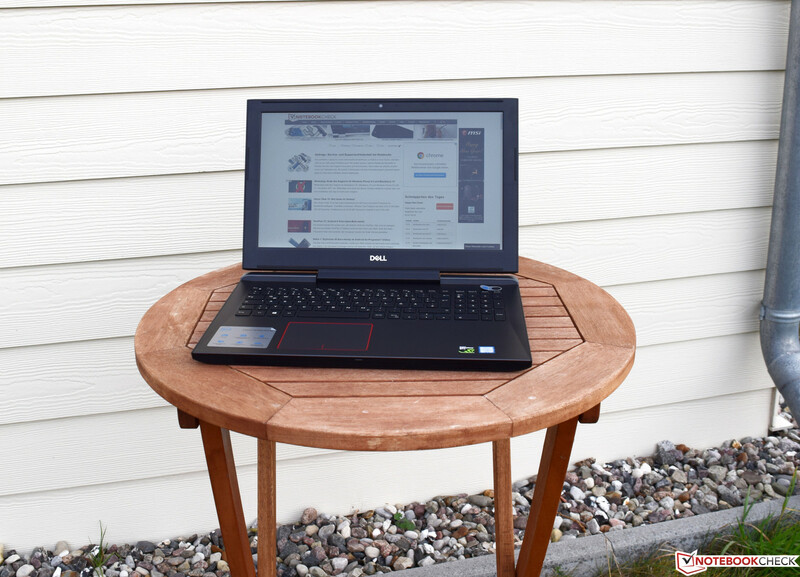 The Dell Inspiron 15 7577 is equipped with a matte IPS panel that has over 1920x1080 pixels. 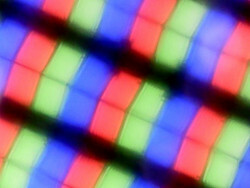 This means that the 15.6-inch display has a pixel density of 141 ppi. Alternatively, Dell also offers a 4K display for this gaming device. 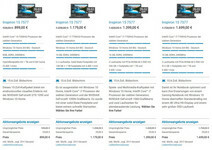 But you will have to decide for yourself whether the additional price is worth it. 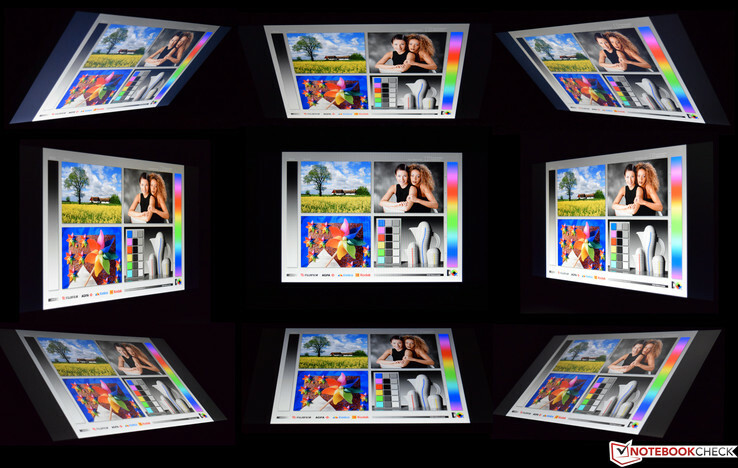 The Full HD panel reaches an average brightness of 229 cd/m². The manufacturer might want to rethink whether this is really what the customer needs. 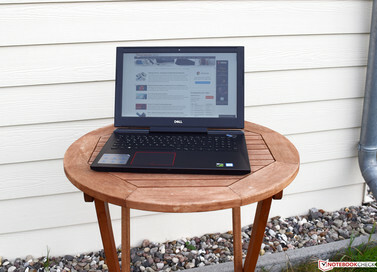 Many other gaming laptops offer significantly brighter displays. The black value (0.17) is low, which is great and means that the device has a good contrast ratio of 1512:1, despite having a rather low brightness level. The brightness distribution of only 84% is below average. However, we were happy to see almost no clouding. 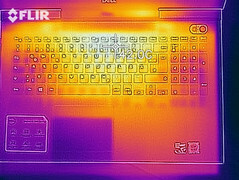 Dell has also managed to use a panel without PWM, so there is no flickering. The display quality can be considered good and the colors do not appear washed-out due to the good contrast ratio. Images are sharp and do not look grained. The average DeltaE deviation of grayscales and colors are 4.8 and 5.3, which is only slightly above the ideal of 3. We did not notice a blue cast. However, the measured color-space coverage (sRGB = 60% and AdobeRGB = 38%) is not good. But this is not too much of a disadvantage when gaming and surfing the web. If you are interested in editing images and videos, you might want to look somewhere else. 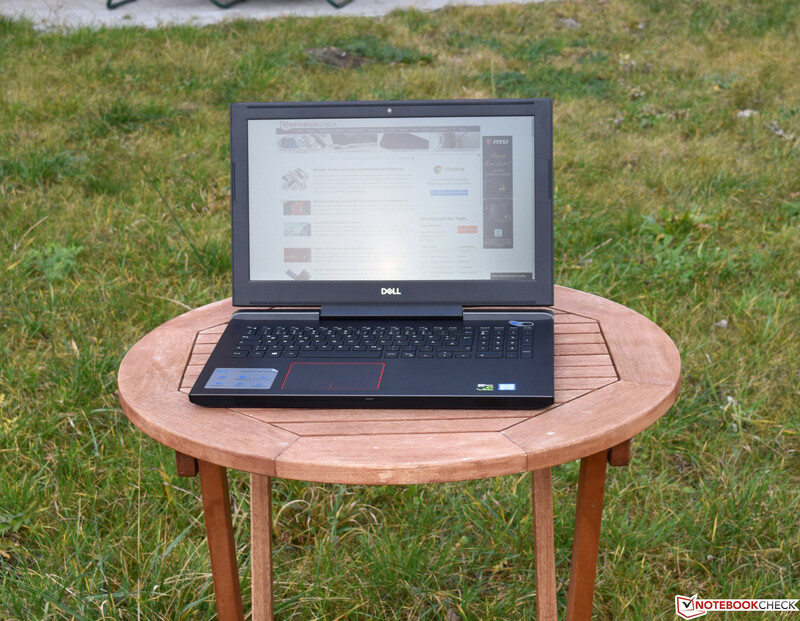 The low display brightness is bad news if you want to use your notebook outdoors, although the matte surface still makes it possible if you avoid direct sunlight. In comparison, all tested devices range from 0.9 (minimum) to 636 (maximum) ms. » 49 % of all devices are better. You can see that this is a good IPS panel if you look at the viewing angles: The test image is displayed nicely from all angles. Even the color veils that are often noticeable in the corner images are basically nonexistent in our test unit. 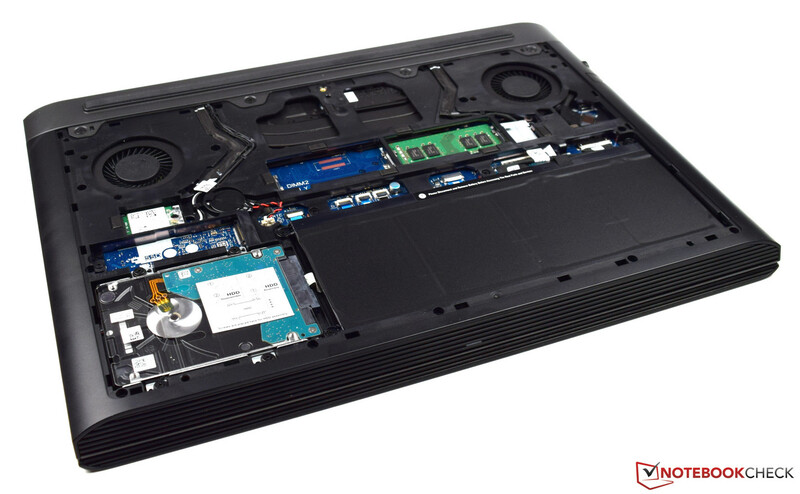 Our test unit offers an affordable entry into the world of gaming laptops. 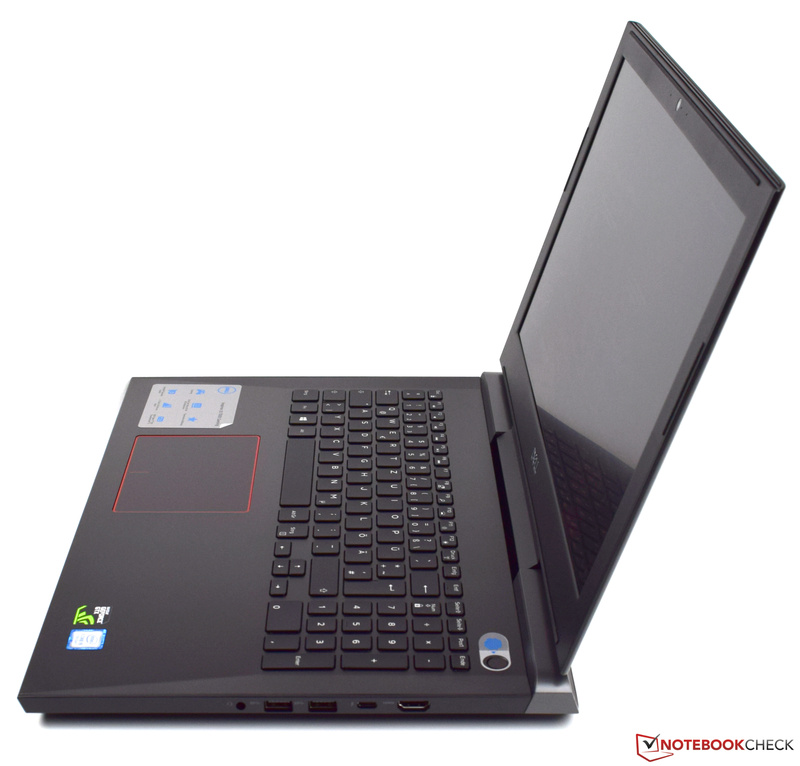 It is equipped with an Intel Core i5-7300HQ and 8 GB of DDR4 RAM. 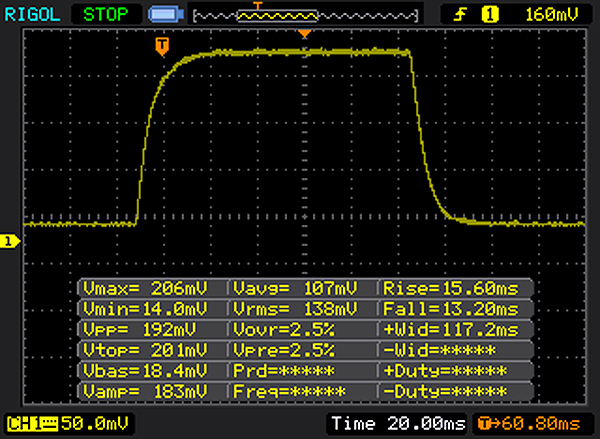 This works in single-channel mode, but the memory can easily be expanded by a second RAM module. The 3D calculations are dealt with by Nvidia's GTX 1050 with its own 4 GB of GDDR5 VRAM and Optimus support. Dell has built a solid foundation for gaming and other applications. Although the Intel Core i5-7300HQ is slowly getting old, the SoC still offers decent performance. 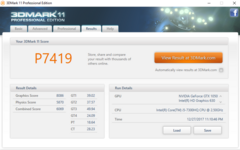 The native four-core processor clocks from 2.5 to 3.5 GHz and has a TDP of up to 45 watts. 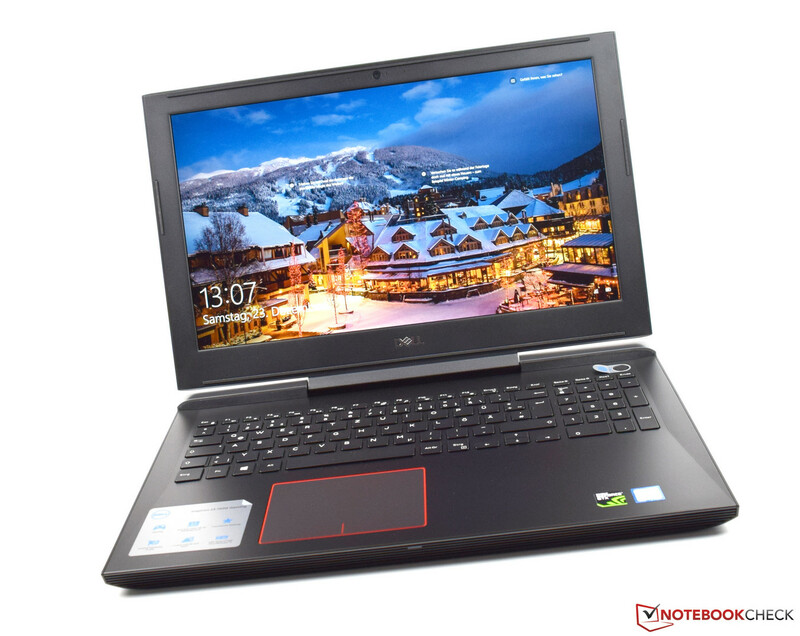 Only the MSI GL62M has significantly better values as it is equipped with a slightly faster Intel Core i7-7700HQ. 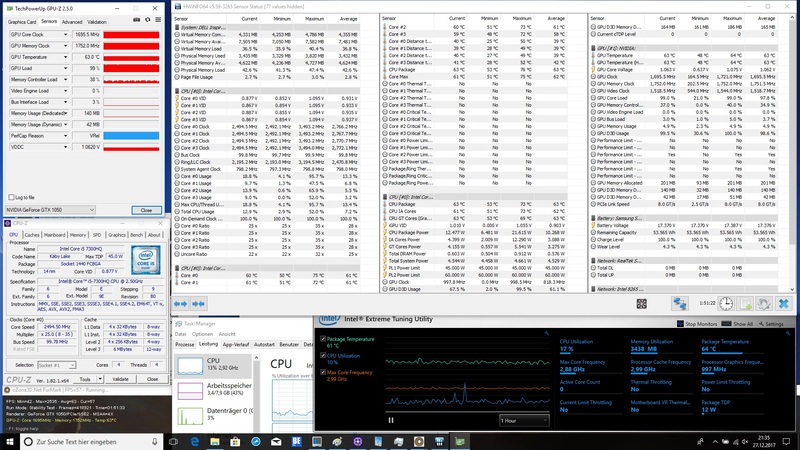 The Intel Core i5-7300HQ performs very well in our test unit. 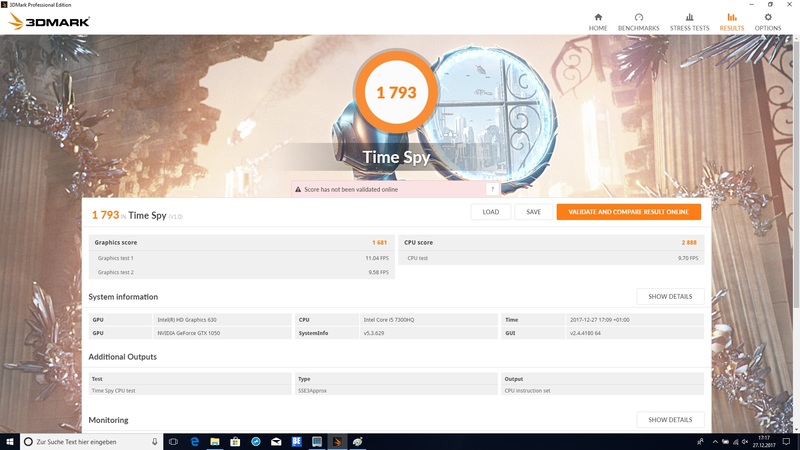 You can find further benchmarks of the Intel Core i5-7300HQ here. 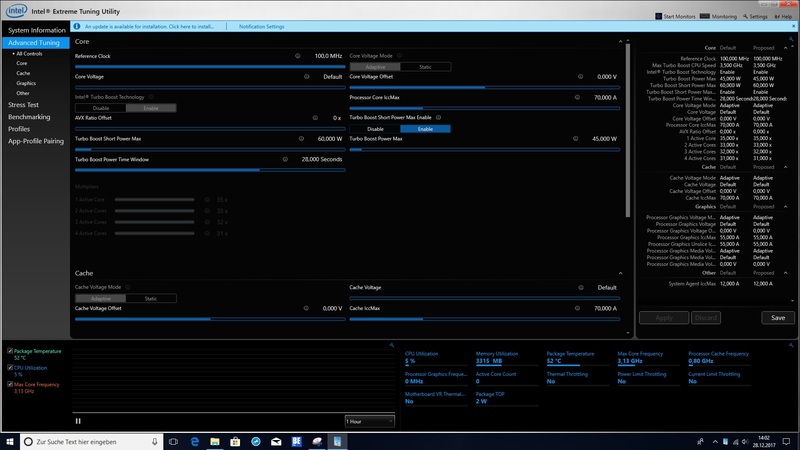 We use the Cinebench R15 Multi loop to measure the processor's performance under constant load. 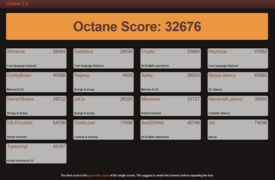 This remains steady even after many rounds of the benchmark. 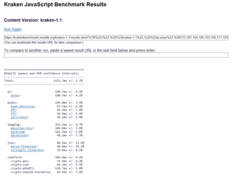 A look at the results of PCMark 8 shows that system performance is quite decent. 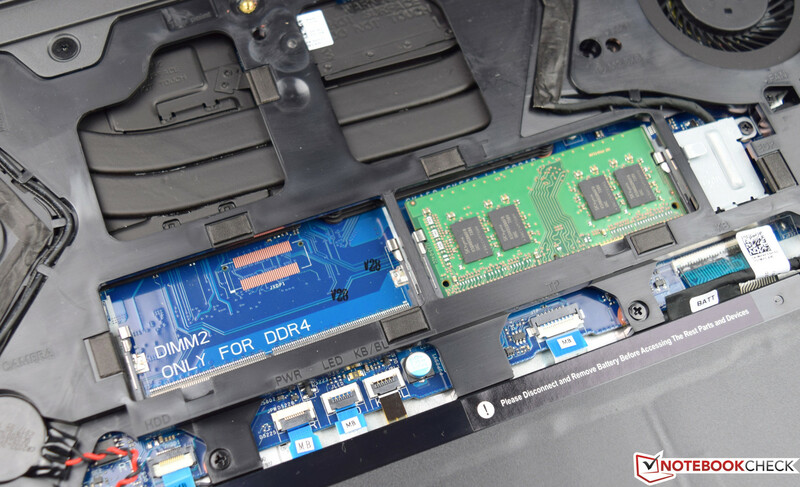 But subjectively we got a different impression, as the hybrid storage device cannot keep up with the performance of an SSD. This makes the entire system slow and you regularly have to wait for things to happen. 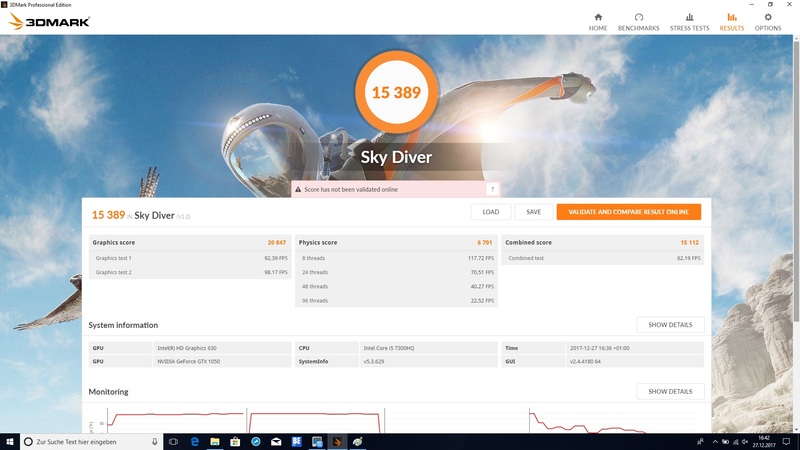 An SSD should be standard for this price range. 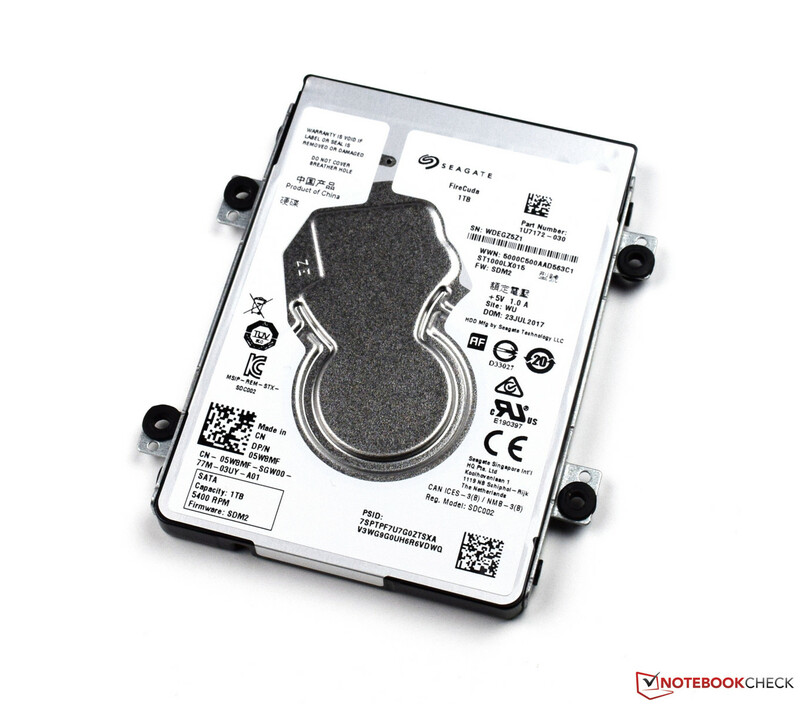 As mentioned above, our test unit is only equipped with a hybrid storage device that has a capacity of 1 TB. The combination of hard drive and integrated 8-GB cache is not impressive. 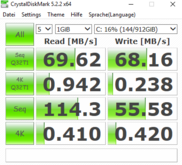 The storage device from Seagate would be a lot better off as a second drive. 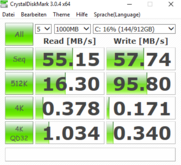 It reaches an average transfer rate of 101.7 MB/s according to HD Tune - and this despite an rpm rate of 5400 (usually only hard drives with 7200 rpm reach these speeds). 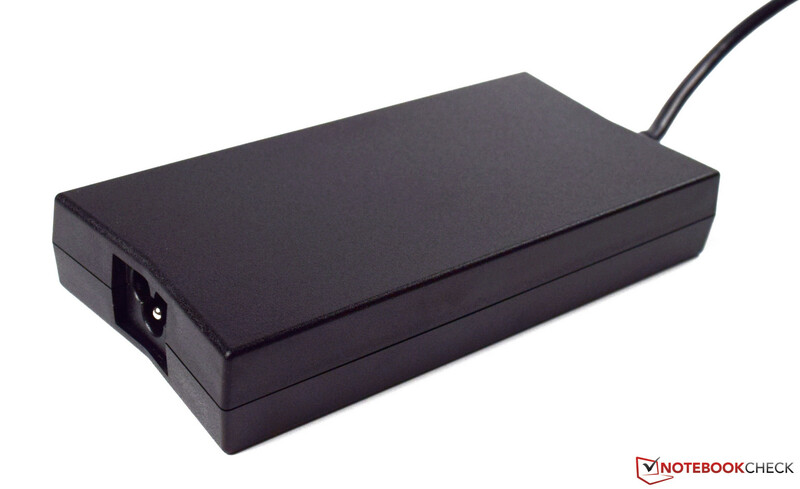 But we cannot recommend using the FireCuda as system drive, so we suggest using an SSD. 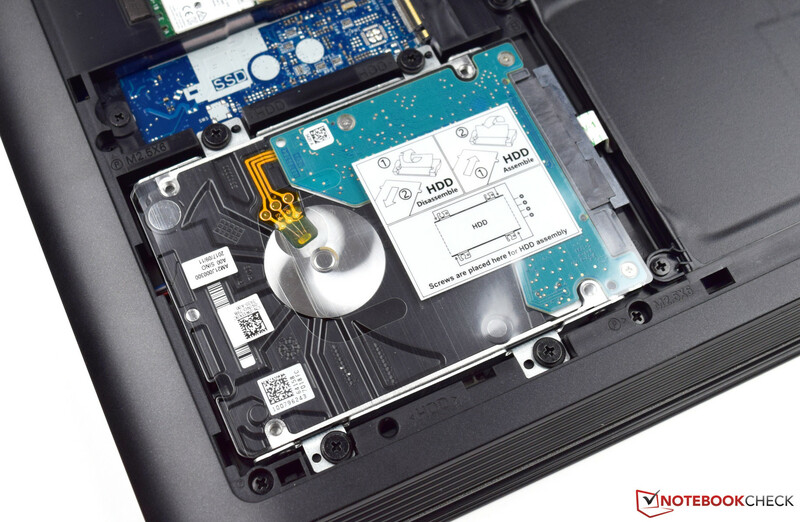 There is a free M.2-2280 slot that offers PCIe speeds, which would enable the use of an SSD with NVMe support. 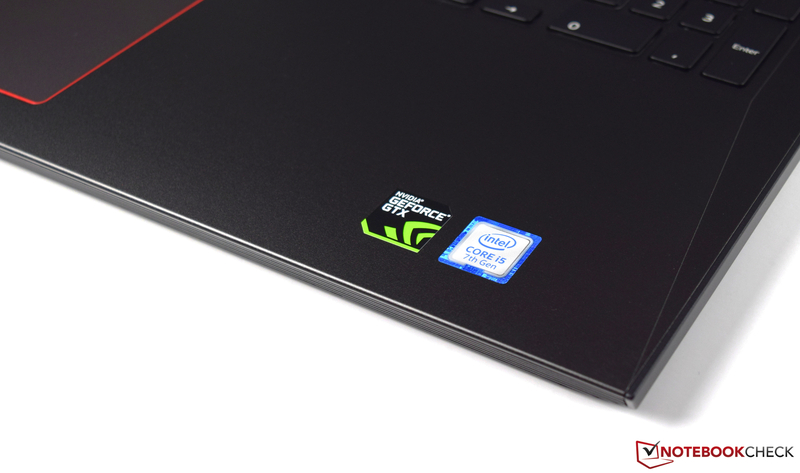 The main focus for a gaming laptop is on its graphics card. 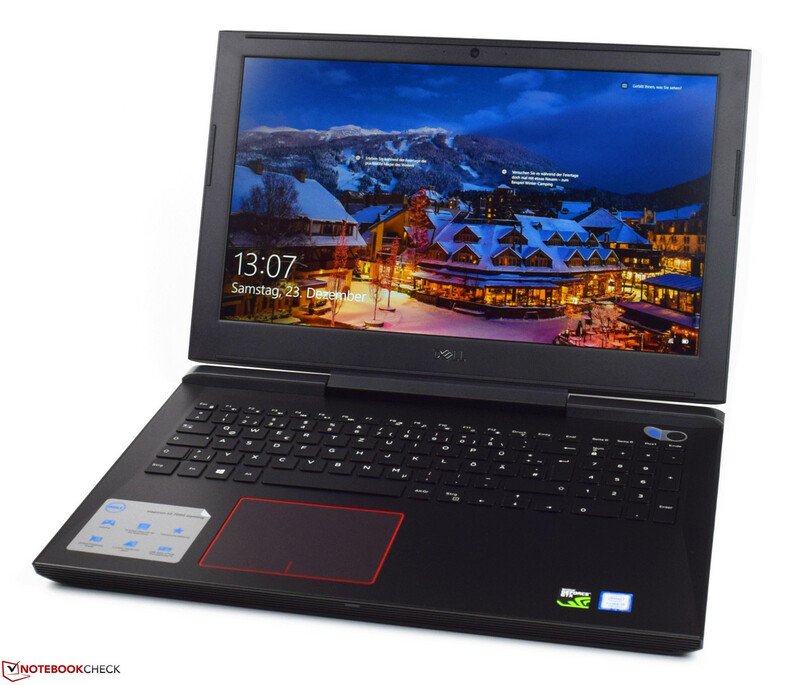 The basic configuration of the Dell Inspiron 15 7577 is equipped with a GeForce GTX 1050 from Nvidia. The dedicated graphics card has its own GDDR5 VRAM with 4 GB and clocks from 1354 to 1493 MHz. If this is not sufficient, you can increase the clock rate a little with the help of various tools. 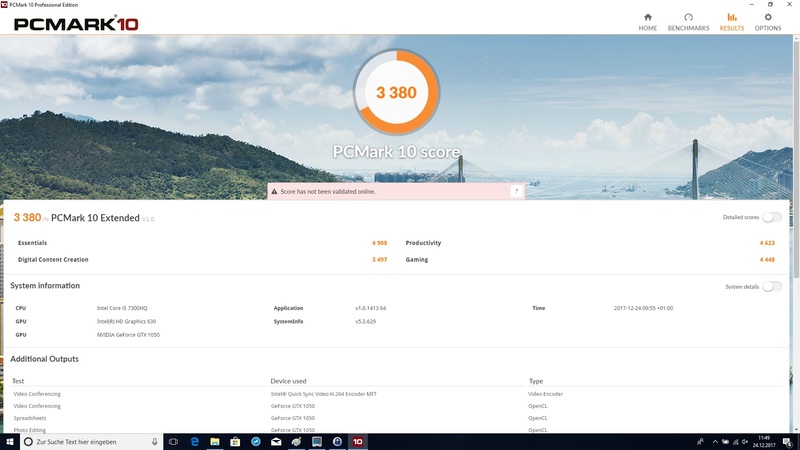 Dell does not offer its own overclocking tool, however, so please be aware that the warranty will not cover any damage caused by overclocking. 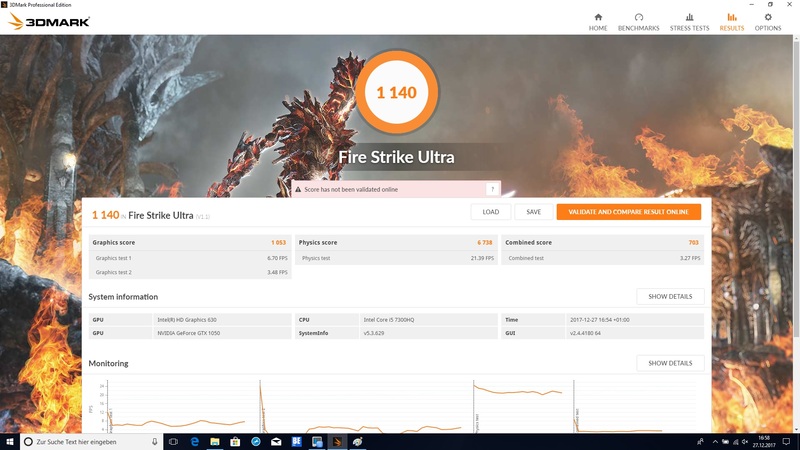 The performance of the Nvidia GeForce GTX 1050 is on the same level as those of its competition. 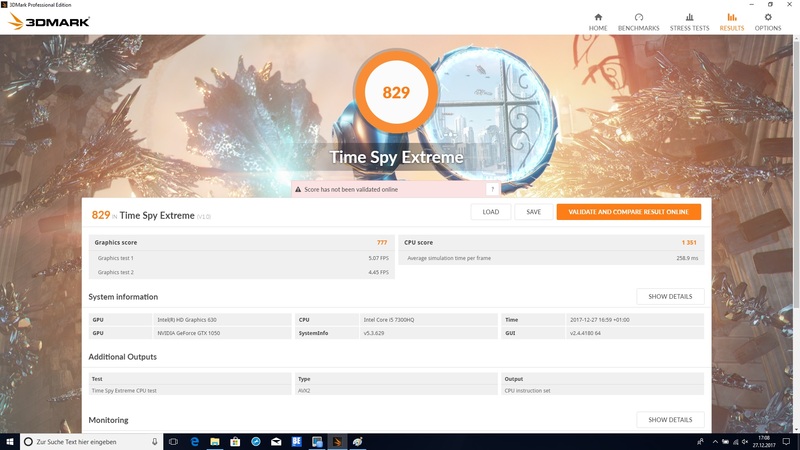 The MSI GL62M, which is equipped with the same graphics card, has almost identical results. 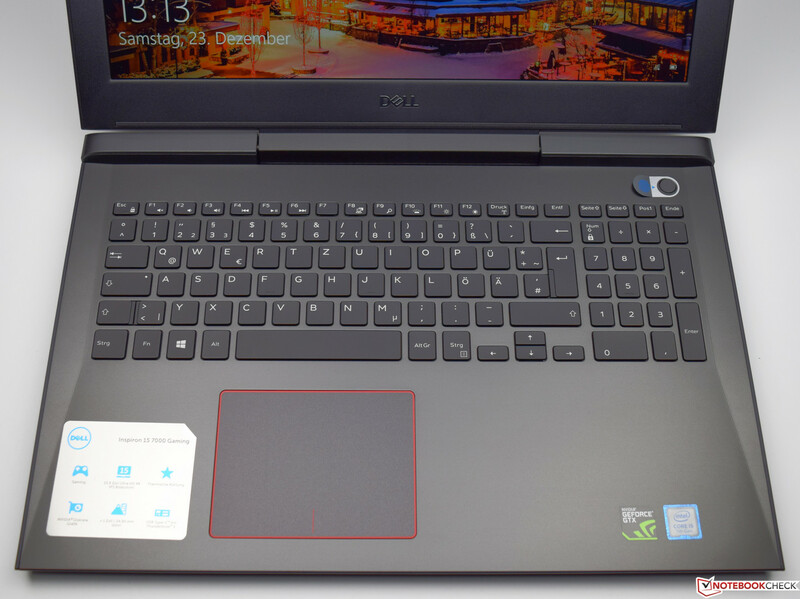 The Lenovo Legion Y520 is in second place with its Nvidia GeForce GTX 1050 Ti, while the version of the Dell Inspiron 15 7000 with an Nvidia GeForce GTX 1060 Max-Q made first place. 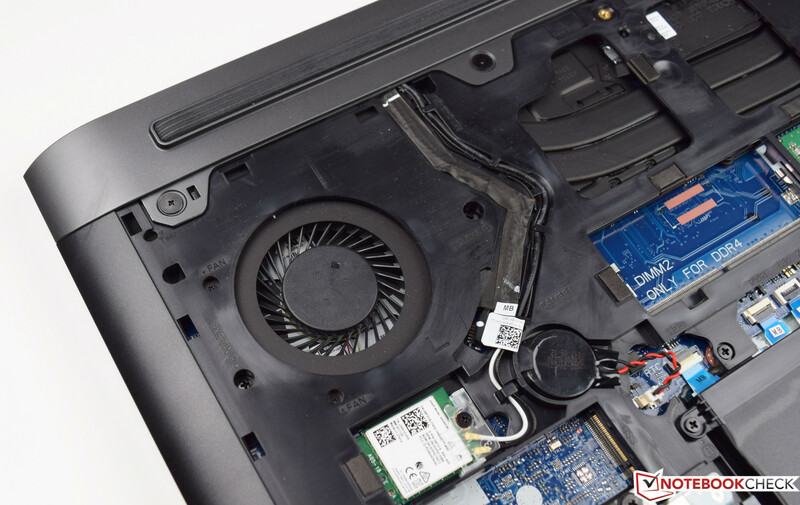 Our Dell Inspiron also has an Intel HD Graphics 630 as its secondary GPU, which is a good option for saving power in 2D mode. 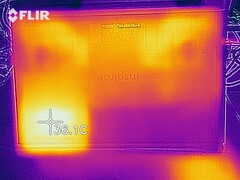 Thanks to Optimus technology, the user is not aware of the graphics switching. 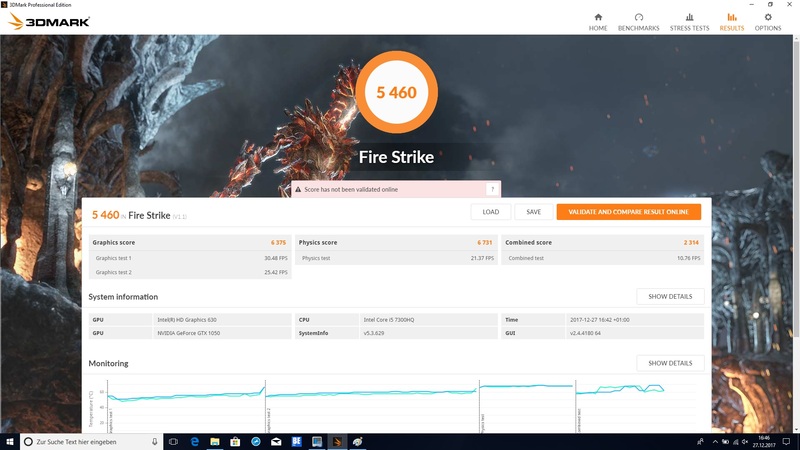 You can read more about the benchmarks of the Nvidia GeForce GTX 1050 and Intel HD Graphics 630 here. 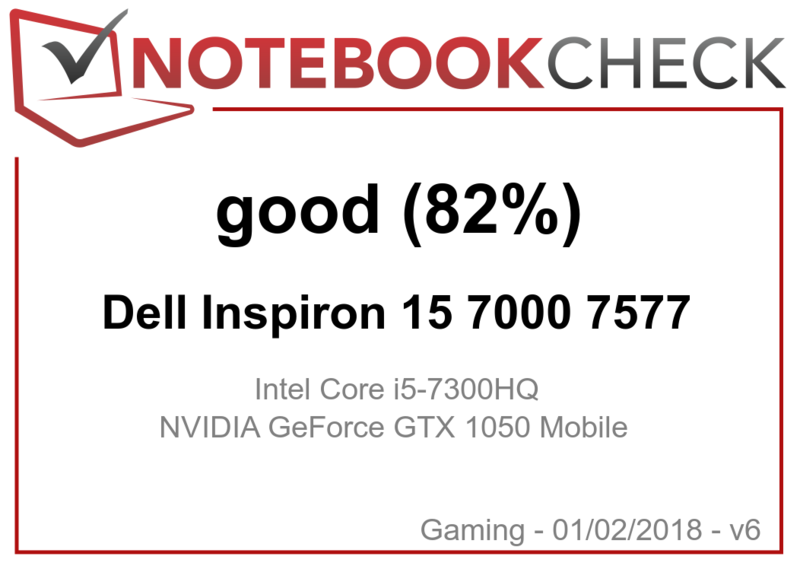 The Dell Inspiron 15 7000 really deserves to be called a gaming notebook. We received good results for all tested games. The Nvidia GeForce GTX 1050 only has a little difficulty displaying the newest games with maximum details. But our test unit still manages to display games with high details in its native resolution. Our long-term The Witcher 3 test showed that the frame rates remain steady even under longer periods of load on the GPU. This means that you should not encounter any juddering, even during long gaming sessions. 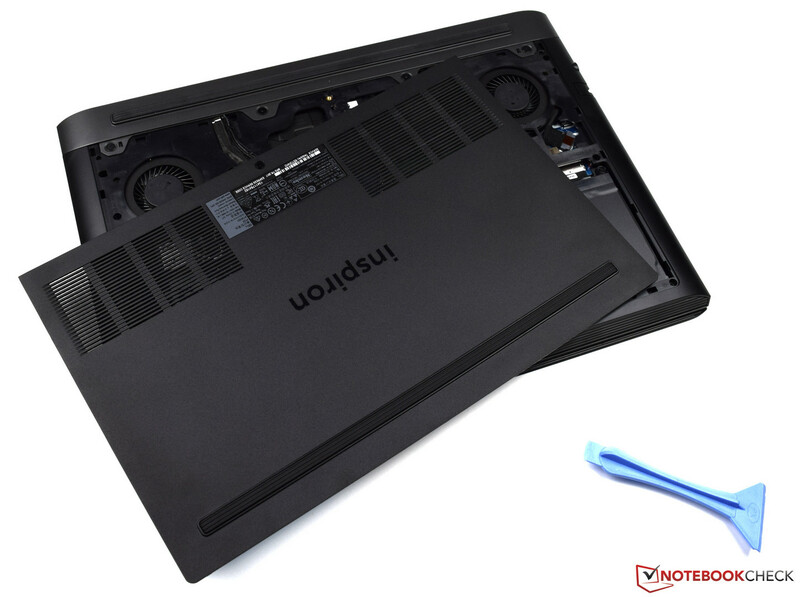 There are two cooling fans that transfer the warm air out of the case. 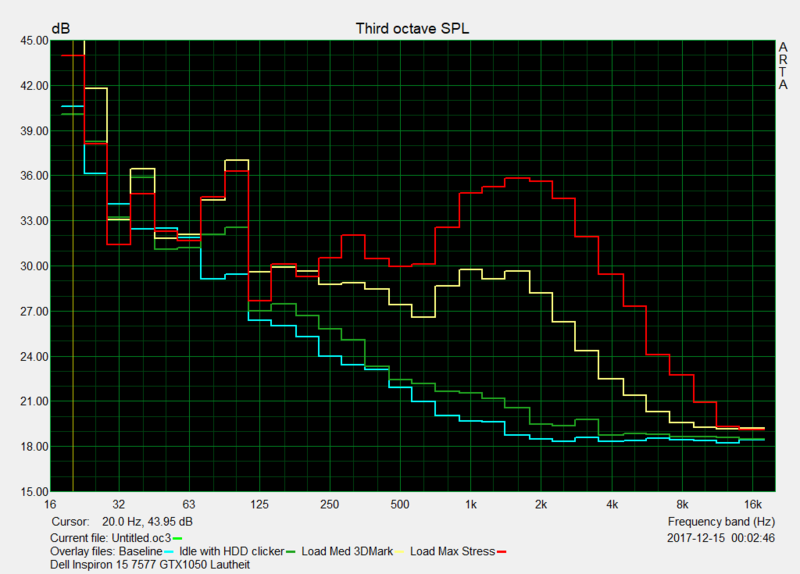 Our test unit is comfortably quiet at 32.7 dB(A), but the storage device is always audible (33 dB(A)). 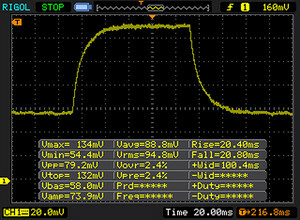 Under load, the system noise increases to a maximum of 44.6 dB(A). 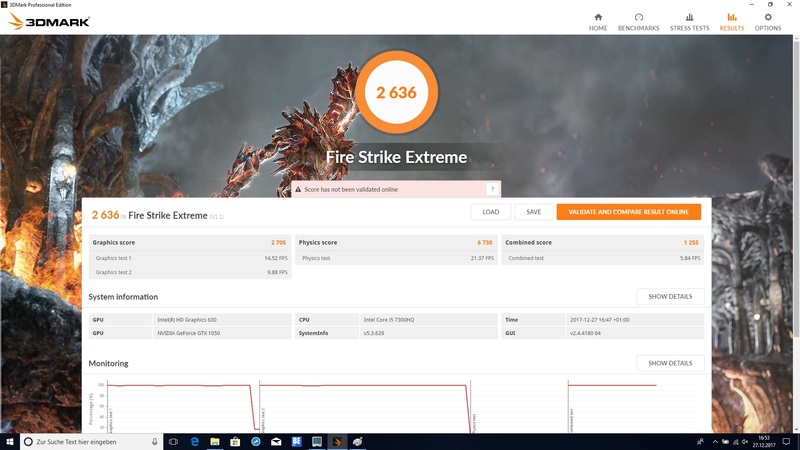 The device is clearly audible in this scenario, but luckily this will only occur very rarely (stress test with Prime95). 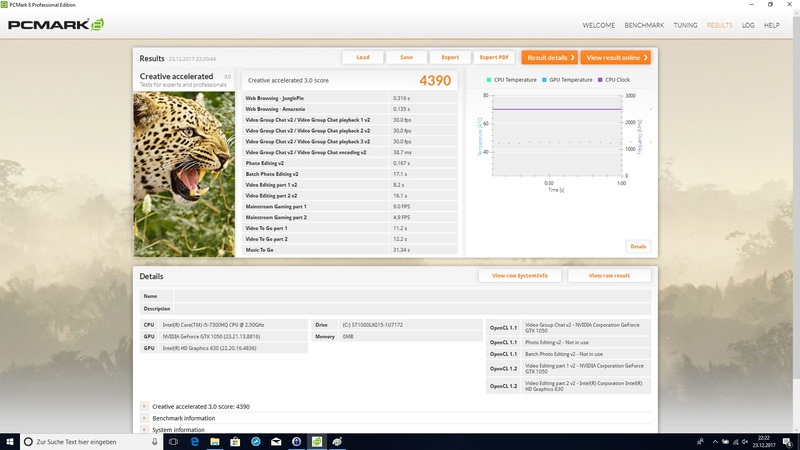 We were happy to see that the system noise was low during our gaming tests. 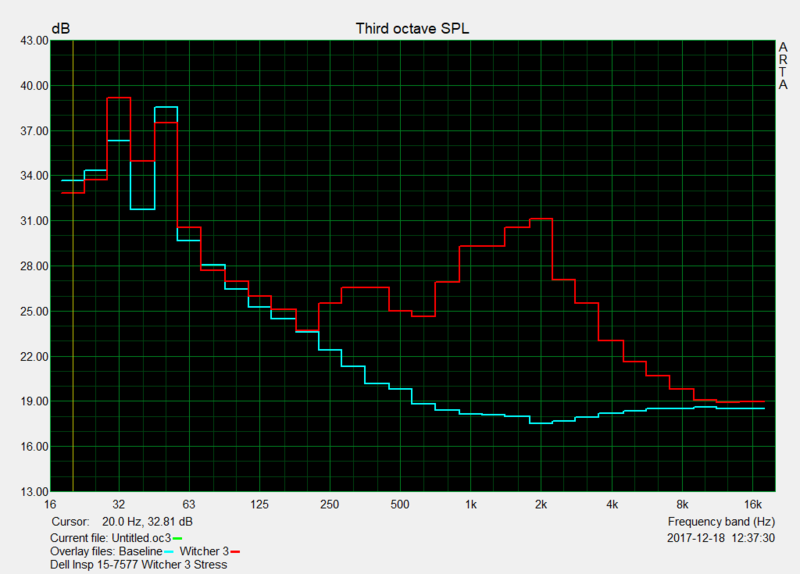 The device was producing 39 dB(A), which is not overly loud. 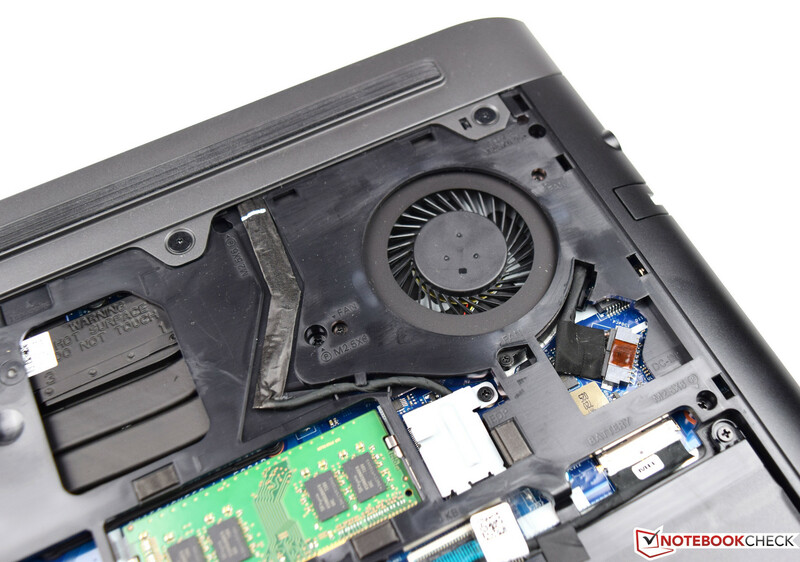 The cooling system consists of heat pipes and two fans. The measured temperatures are all fine. The case does not heat up too much and reaches a maximum of 41.6 °C (~106.88 °F) on the bottom of the base unit. 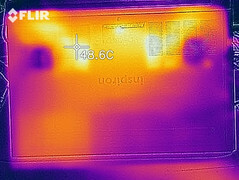 The heat pipes and two separate fans also keep the inside temperatures under control. The processor can reach its full potential and does not have to be throttled due to high temperatures. 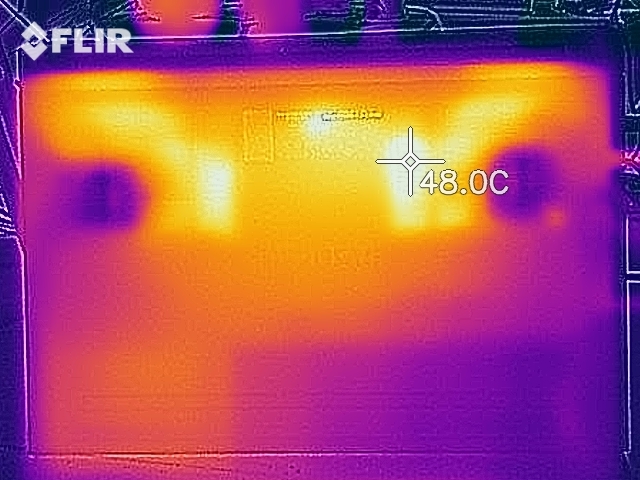 We measured a maximum of 92 °C (~197.6 °F), but this was only for a short period and is not worrying, as the processor worked at a steady clock rate of 3.1 GHz throughout. The GPU also had no difficulties with working for a longer period of time. We measured a maximum temperature of 68 °C (~154.4 °F). 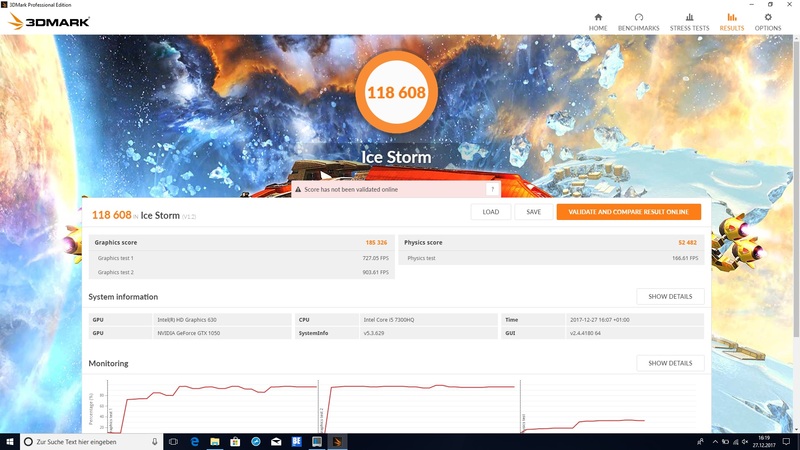 The cooling system already showed what it could do in the Cinebench R15 Multi loop and the long-term The Witcher 3 test. 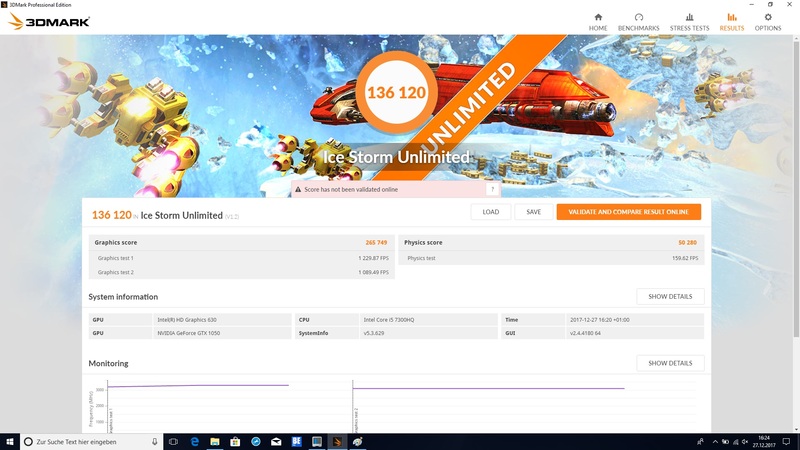 Therefore, we were not surprised to find that the results of 3DMark 11 after the stress test were the same as before. 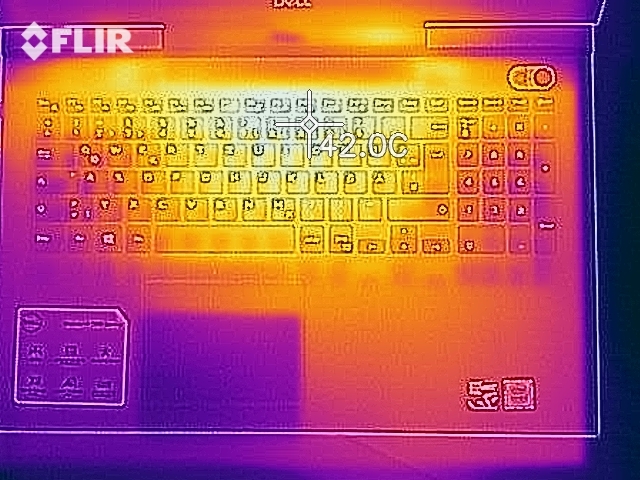 (+) The average temperature for the upper side under maximal load is 30.8 °C / 87 F, compared to the average of 32.9 °C / 91 F for the devices in the class Gaming. 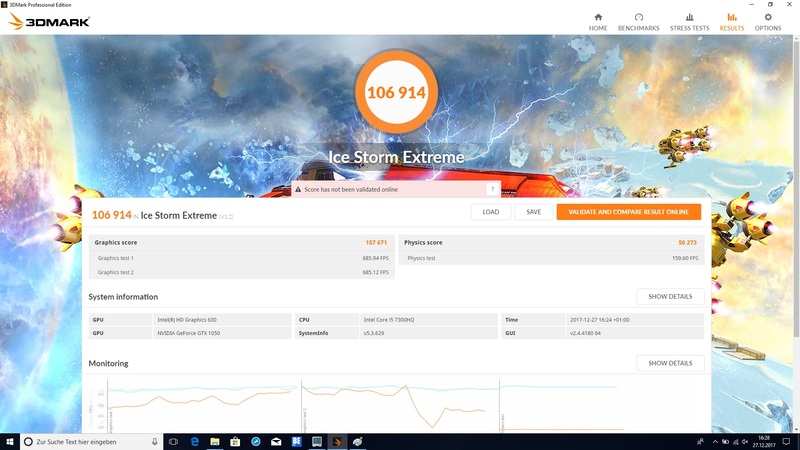 (+) The maximum temperature on the upper side is 35.9 °C / 97 F, compared to the average of 39.3 °C / 103 F, ranging from 21.6 to 68.8 °C for the class Gaming. (+) In idle usage, the average temperature for the upper side is 26.4 °C / 80 F, compared to the device average of 32.9 °C / 91 F.
(+) Playing The Witcher 3, the average temperature for the upper side is 28.4 °C / 83 F, compared to the device average of 32.9 °C / 91 F.
(+) The palmrests and touchpad are cooler than skin temperature with a maximum of 29.1 °C / 84.4 F and are therefore cool to the touch. 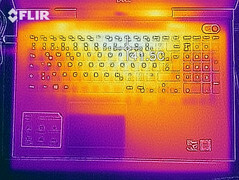 (±) The average temperature of the palmrest area of similar devices was 28.7 °C / 83.7 F (-0.4 °C / -0.7 F). 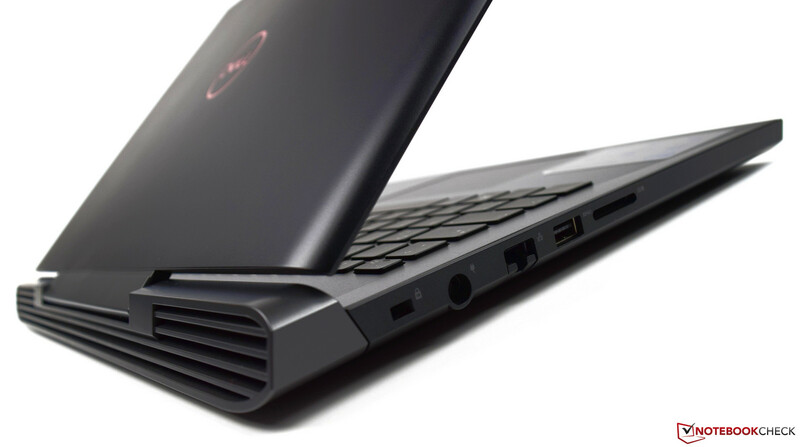 Dell has equipped our test unit with two speakers that are both positioned beneath the wrist rest. They face the user, which prevents the sound from being muffled when lying on a soft surface. 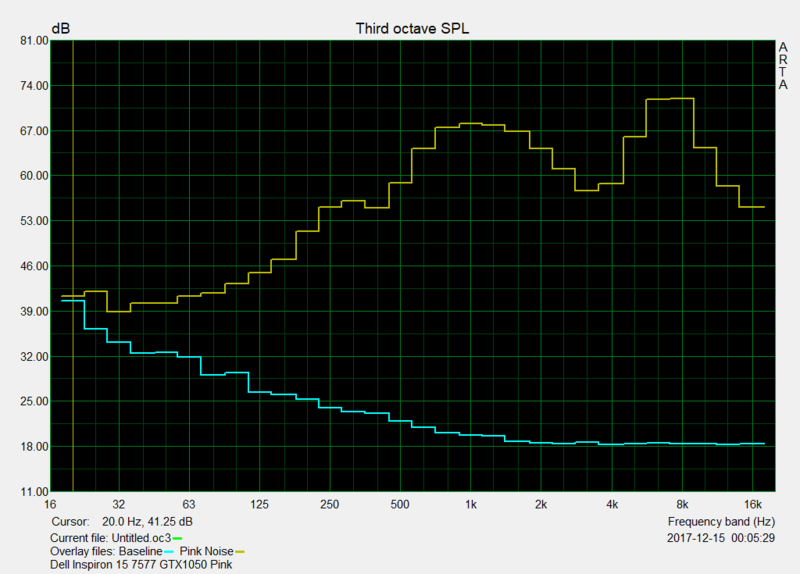 Unfortunately, there is no dedicated sub-woofer, so the base frequencies are hardly audible. 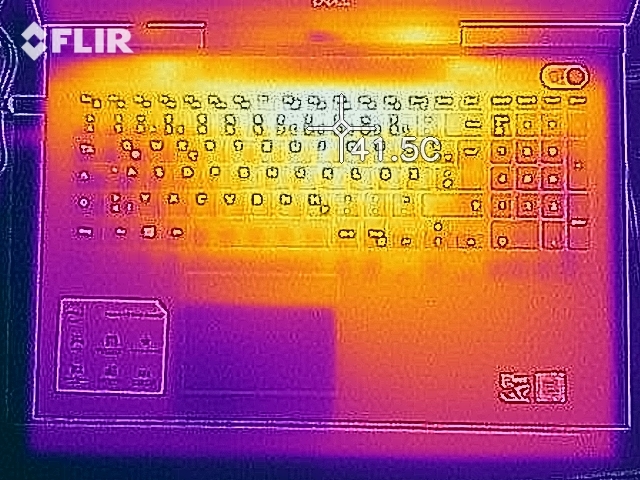 You can feel the wrist rest vibrate at full volume (78.6 dB(A)). We did not hear any unwanted noises. The software Waves lets you adjust the sound image a little, but of course it cannot perform miracles. 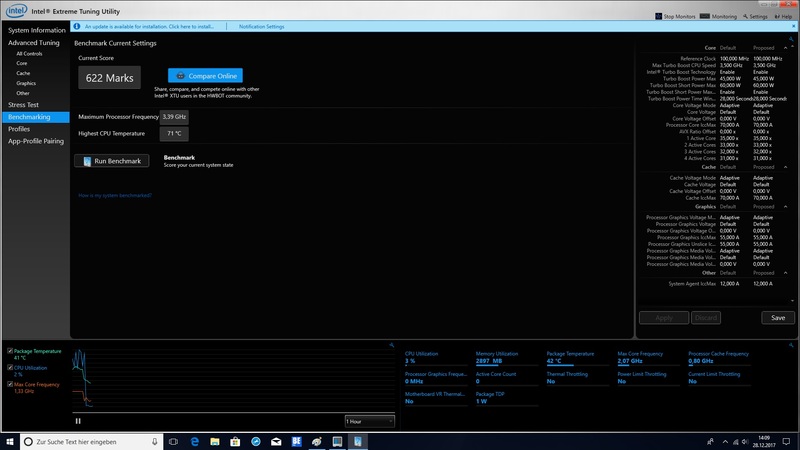 We liked the simple recording tool, although the recordings seem to have a lot of background noise, which is not ideal. The quality is good enough for video-chatting. 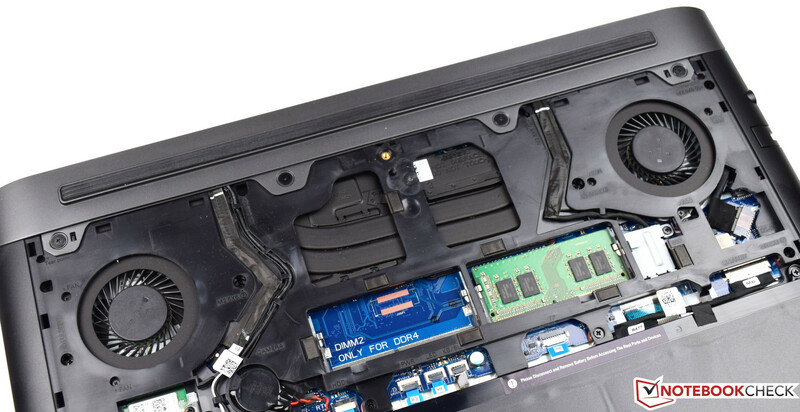 The Dell Inspiron 15 7000 has a 3.5 mm audio jack (headphone/mic) on the right side, with which you can connect external speakers. 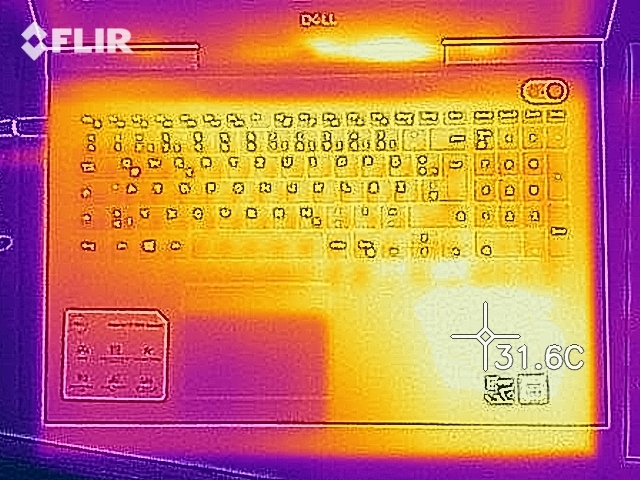 The Dell Inspiron 15 7000 requires a maximum of 109 watts, which is fine. Compared to the Maxwell generation, the power consumption of Pascal architecture could be improved significantly. 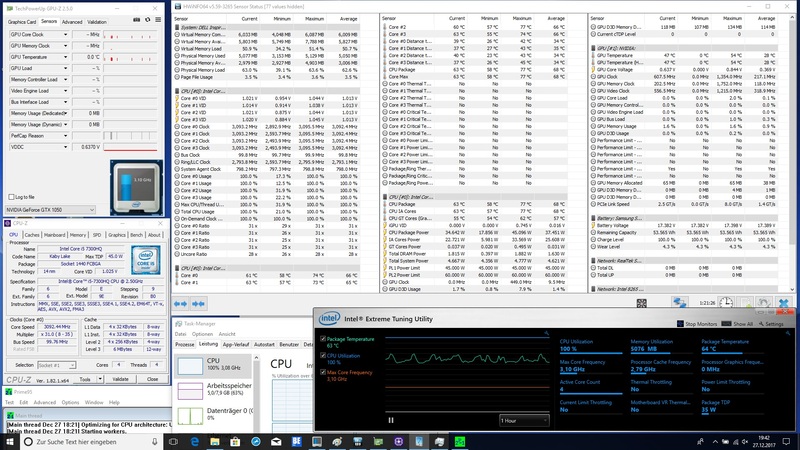 The Dell has an advantage over its competition from Acer and MSI while idling but has to admit defeat during average load - 100 watts is way too high and all comparison devices are more energy-efficient at this level of load. 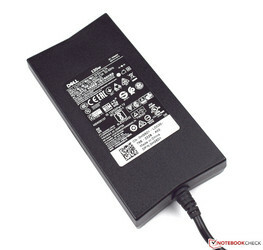 The slim power supply offers enough power at 130 watts. ...a maximum of 130 watts. The battery runtimes are very good considering the device classification. 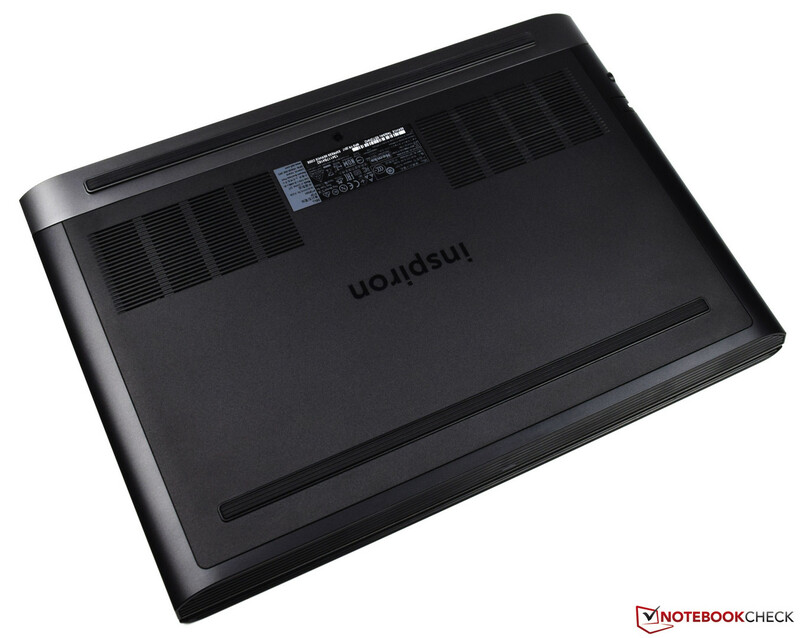 However, the Dell Inspiron 15 7000 is equipped with the largest battery capacity (56 Wh) of this comparison field. While idling, the device can last about 11 hours on battery. Our Wi-Fi test is a lot more interesting - here, our test unit still reaches a good runtime of 6:45 hours. For this test, we dimmed the display brightness by four levels (~150 cd/m²). 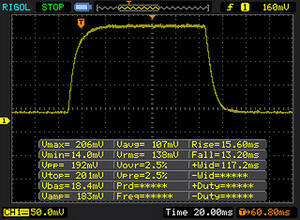 Even under load the device can run for almost 2 hours before needing to be reconnected to power. 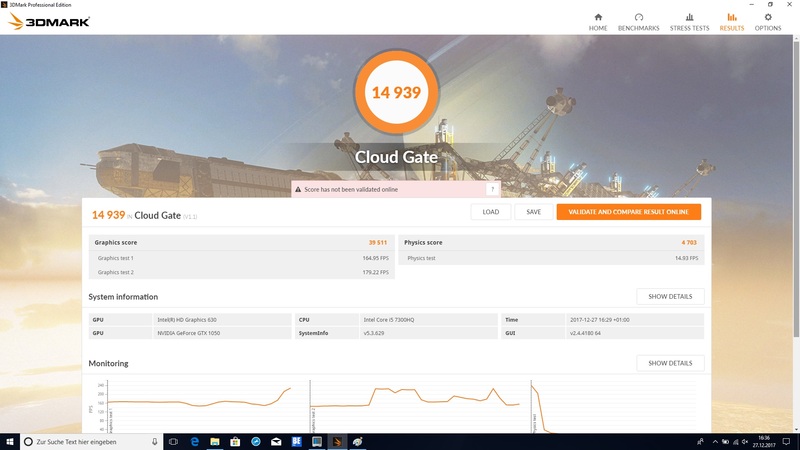 Unfortunately, gaming performance is not so good on battery and the result of only 3347 points in 3DMark 11 is a lot worse than on power supply. 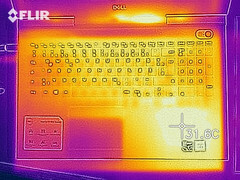 The Dell Inspiron 15 7000 7577, test unit provided by Cyberport. 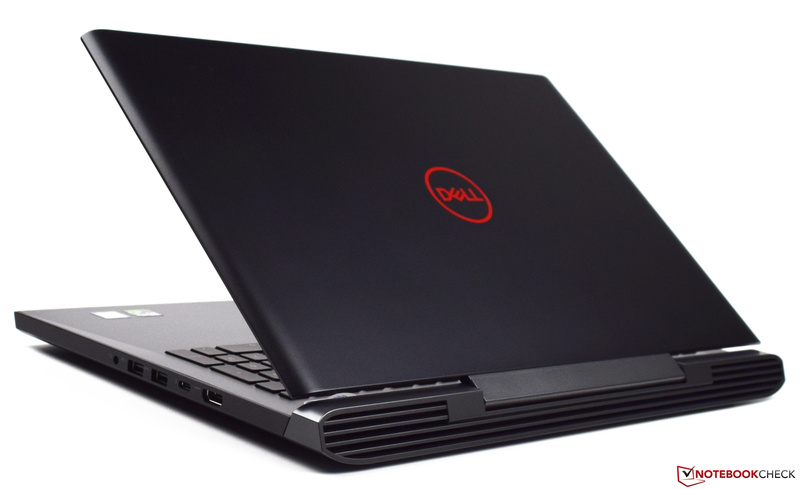 Dell has made a lot of good choices with the Inspiron 15 7000 7577 and combines suitability for gaming with a long-lasting battery. The device is made of well-known components such as the Intel Core i5-7300HQ, which still has some life left in it. 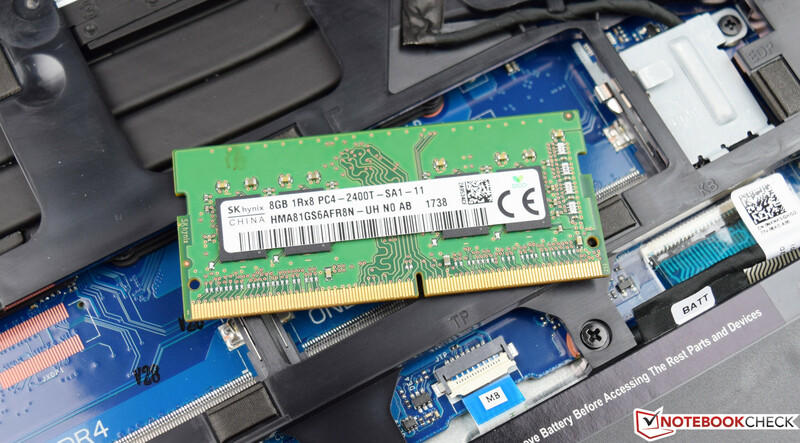 The 8 GB of DDR4 RAM is sufficient, and expanding the memory yourself is very easy. The stable and simple case gave us a good general impression, as did the performance of the Nvidia GeForce GTX 1050. 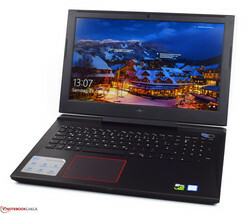 For $750, potential buyers will receive a gaming laptop that is able to display the newest games smoothly. We would like to highlight the long battery runtimes, which are often lacking in gaming notebooks. 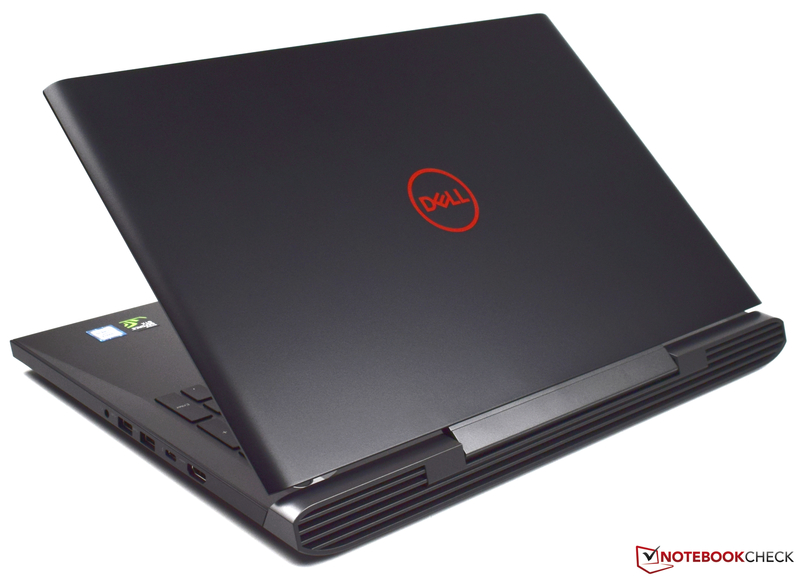 Dell has presented an affordable gaming notebook - the Inspiron 15 7000 7577. 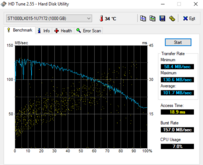 But the hybrid storage device cannot replace the advantages of an SSD. We must take off a few points for the missing SSD. The hybrid storage device does a good job, but even everyday activities can require some waiting, which can be annoying. If you are really interested in buying this device, you should go for a combination of SSD and HDD. The display gave us mixed impressions as well. Thanks to IPS technology, it impressed with very good viewing angles. 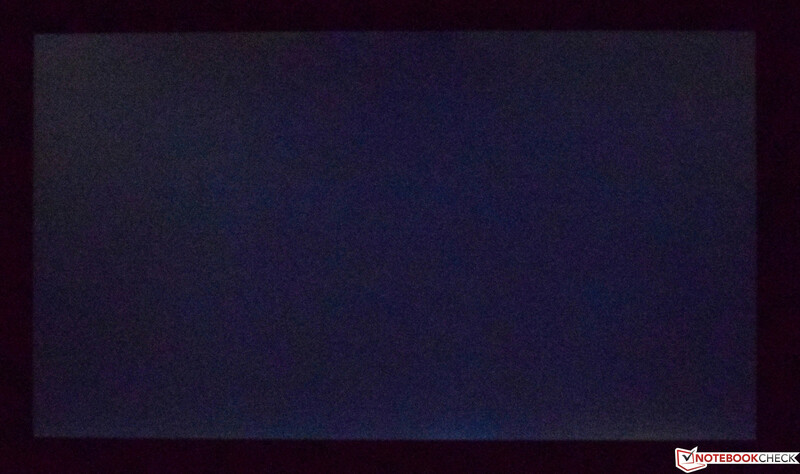 However, the low color-space coverage and display brightness did cost the device some points.